With the birth of the Arab Spring, the United Arab Emirates’ authorities seem to be intimidated by any voice asking for reforms and change. The start was with the arbitrary arrests of five activists for signing an online petition and keeping them illegally in custody for months before giving them a ‘pardon’ as part of the annual national celebrations. Shortly afterwards, seven political activists were stripped off their citizenship after an issued order by Sheikh Khalifa bin Zayed Al Nahyan, the president of the UAE. Lately, a new case of violation of free speech came out after the arrest of Saleh AlDhufairi, an Islamist calling for change. 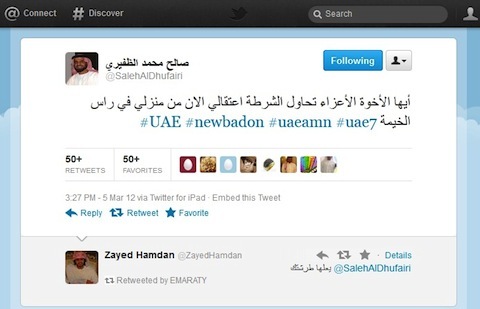 Dubai Police Spokesman announced that Saleh Al Dhafairi has been arrested on charges of incitement. According to the Dubai Police statement, Al Dhafairi has been accused of incitement through writing or verbally spreading ideas that damage national unity or social peace. The spokesman confirmed that Al Dhafairi will be referred to the Attorney General after 48 hours, stressing that the law punishes sedition-makers. He added that what the accused has done falls under the jurisdiction of the federal law. In response, Al-Islah Islamic group issued a statement condemning the arrest of AlDhafairi saying those arrests will not stop their demands and that they refuse the acts of stripping citizens off their citizenship or arresting them. Al-Islah indicates that when arrested, AlDhafairi asked for his arrest memo, and in response, state security police broke into his house and arrested him.